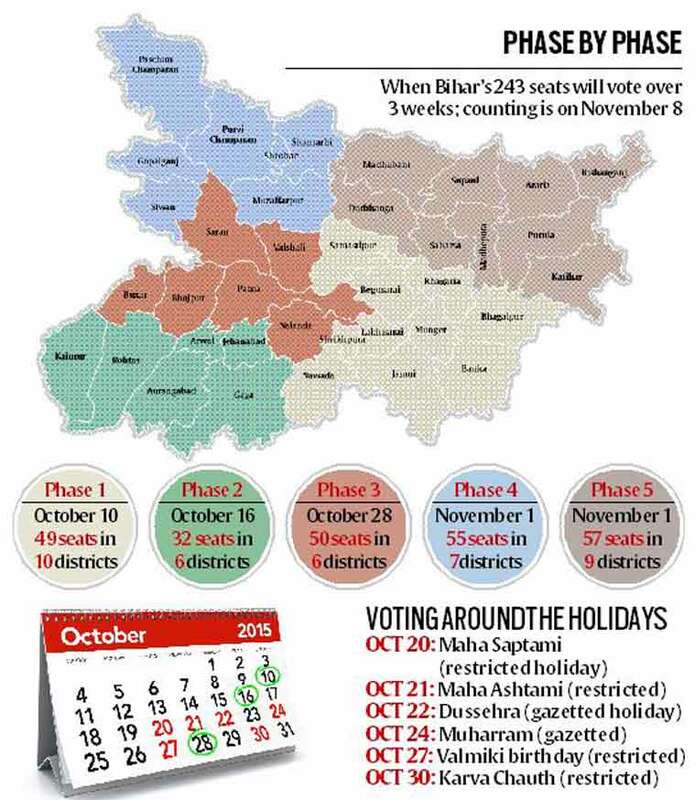 The announcement of the Bihar election schedule, starting October 12, marks the countdown for a contest that has begun to crystallise around three key questions being asked across the state, from Patna to Chhapra, Bhagalpur to Saharsa and elsewhere. Is the coming together of Nitish Kumar and Lalu Prasad a sign of weakness and a kind of neutraliser for the development plank of Nitish Kumar? Will 25 years of rule between the two mean double anti-incumbency and a vote for change? And to what extent will Narendra Modi’s chemistry with the populace counter the social arithmetic of Nitish-Lalu combination? Whether it is with a Muslim paan seller at Sheetalpur market on the way from Patna to Chhapra, or with residents of Gandamam where the midday meal tragedy took place, or with an EBC Nonia village on the way, it is these three questions that seem to be setting the template for the elections. Jaleshwar Mahato, an EBC Nonia from Chhapra Abhiman Dolahi village in Saran, has 18 members in his family, eight of them voters. The family, which depends on sharecropping and odd jobs, got power connections for their brick-and-asbestos house four months ago and said they barely get six to seven hours of supply daily. The village is part of Amnaur, won by the JD(U) in 2010. The JD(U) had won four of 10 seats in Saran while its erstwhile alliance partner the BJP had won two. Mahtab has four children. His eldest daughter has received money for a school uniform and a scholarship under government schemes. She is still waiting for money to buy a bicycle, he said. Jaleshwar Rai of Dariyapur, the village of former chief minister Daroga Rai, said the Yadavs are more or less with Lalu Prasad but there have been “problems” with Lalu’s acceptability among other caste groups. “For us, Laluji is the leader but other caste groups are not comfortable with Nitish and Lalu coming together,” said Rai, a small farmer.